Ill do this day by day. Myself and a few friends left our shop at 4pm on thursday afternoon. 2 Hours later just north of Columbia, SC. we lose the motor. it stats knockig badly. So while we wait for our friends wife to come pick us up, we have to unhitch the trailer and put the truck on a tow truck. She finally comes and gets us (2 hours later) and we begin our drive back to Mooresville (Just north of charlotte). So around 1030 Pm we begin our journey back. By now i realize there is no way im doing the Team Hammer Practice day on Friday. We finally get the trailer loaded up again around 1230 am and continue onto fresh ground. around 3am after getting gas in GA. we accidentally got on the north bound land and stuck there for 15 miles. We finally roll into the speedway at 715am. 15 hours after we left for the track. Normally it only takes about 6-6.5 hours. I was completly turned off from doing the team hammer day, even though i wanted to shake out the new bike. 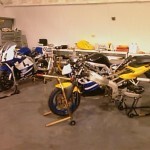 so i ended up entering Lightweight Superbike, Lightweight GP, Ultralight SuperBike, CCS Thunderbike & ASRA Thunderbike. We get inside and get ready to start unloading. i move a ton of fuel around and prepare to unload the bike. the first thing i noticed is my cheapo clutch lever is broken. Good thing Street & Comp is here, I needed some stuff anyways. Anyways, i spent the day just doing various setup related items. I also got the bike suspension setup by John of CTR Suspensions. JB also got my pitbike running for the first time in 6 months. 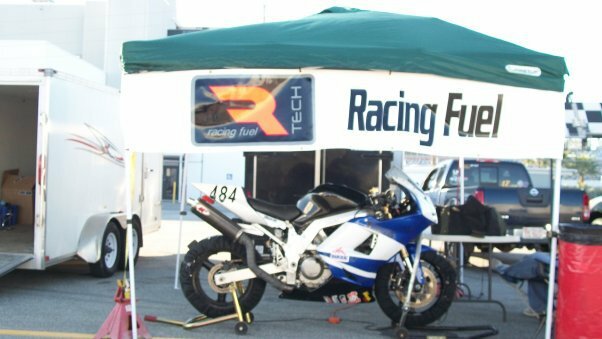 The one thing i really hate about Daytona is tech inspection, it wouldnt be so bad if you didnt have to push your bike up a 2 foot tall ramp. Friday at lunch I picked up a can of Carb Clean, If you think you need 1, you need 2 in reality. I sprayed down the entire carborator and then proceeded to hit the jets. I ran out as I working on the main jet for #3. After getting them all cleaned, I got everything put back together.Thursday evening I decided it would be easier to drop the motor to adjust the valves. Today I was planning on just taking off the radiator. Well after I drained and flushed the radiator a few times. Off it came. The next thing i looked at was the exhaust. Well I guess I can take that off too. 10 minutes later, I had the exhaust off the bike. Looking at what was remaining was just a few wires to be unplugged, and the ground wire and the starter wire needed to be unbolted. thats easy. Off they came. Then came the motor, Its just 4 bolts. Yeah Ill drop it now. To which I then remembered after i started lowering the motor, that I never took off the clutch cable. After trying to remember how to take it off, I got the motor out and put onto the table. My next step is trying to make a stand for this, As the oil pan is a awkward shape and will not allow the motor to sit on the table level. The other thing I realized when I got the motor on the table is, I have 4 motorcycles sitting here. and not a single one of them is 100% put together and or running. the supersport bike just needs the seat put on and i believe it will be done from there. the ttr50 refuses to start. the superbike needs a subframe and a fuel map. and the 6r, i just told you i just drop the motor. 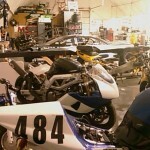 I spent a couple hours at the shop tonight working on the superbike. I repaired the wiring harness and reinstalled. I got the airbox mounted up for the most part, and the tank is on now. I also got the new subframe bolted on, Still need to add parts to it though to finish building it. I also ordered a new steering damper bracket for a 06 GSXR 600, So i can swap my stabilizer between the SuperSport & SuperBike. Hope to get it dyno’d and mapped sometimes next week. I went to bed saturday night, with the intention of getting up at 430am to head to the track at about 1030. I woke up @ 1230 and 230. After 230 i could not fall asleep to save my life. So around 4 i dragged myself out of bed and left for the track. Once I arrived I found a great place to pit, Close to tech and next to Method Moto the Pirelli Vendor. This will work good since my pitbike was not running. Once registration is open, I go register for Lightweight Grand Prix and UltraLight SuperBike. After getting hassled in tech over my boots I finish up setting up for the day. Practice – What a nightmare, Bike handled like complete crap. That might have something to do with the 3 trackdays + 8 or 9 races & 5 practice sessions I had on them already. I came in early as i just wasnt confident in the bike overall. I brought it in and talked with Rick from Method Moto who looked at the tires and said the front was barely warm and the rear was fine. I park it and take the wheels off. After getting a new set of stickies, I decide to throw the wheels in the trailer since rumor had it was going to rain. I also found out a track friend of mine Dale the Continental Dealer had gotten some RTech from another track friend. I wanted to get some so I could get the bike setup on it for when i start selling it next season. After talking with Clinton, we came up with some ideas that will help us both out. I talked with the Guy at Pit in and he says it was for jumping the start. apparently we are in the AMA now and fork movement consists of a start. And the guy who was leading, defintely left before i did. Nothing i can do about it now. I would like to thank Woodcraft, Vortex, Sharkskinz, Method Moto, Boston Moto, Pirelli, Lockhart Phillips, Sidi, Vemar, & CT Power & Sport for their support. Without it, I would not be able to do what I am doing.